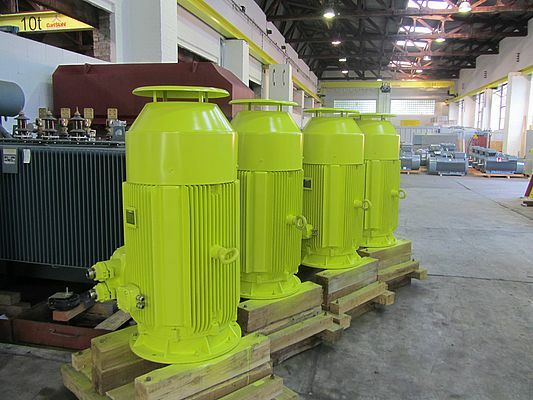 Menzel Elektromotoren delivers IP67-protected three-phase low voltage motors that are suitable for use in flood-risk areas to European pump manufacturers and various end users. The units are for instance used in water pump stations that are threatened by flooding at a regular basis due to a lack of infrastructure. Thanks to the high protection class with encapsulated, waterproof housings and terminal boxes, the motors can be flooded without water ingress while at a standstill. Once the water recedes, they can be switched back on immediately. The supplier also offers motors with ingress protection beyond the industry standard IP55. Low and medium voltage three-phase motors are available with the following increased protection classes: IP56 (protected against powerful water jets), IP65 (dust-proof), IP66 (dust-proof and protected against powerful water jets), and IP67 (protected against occasional immersion). Thereby, Menzel provide reliable motor solutions for use in the cement industry, in desert environments, or on deck of ships. They are available as B3, B5, V1, and B35 versions up until frame size 500 for all voltages between 220 and 11,000 V.